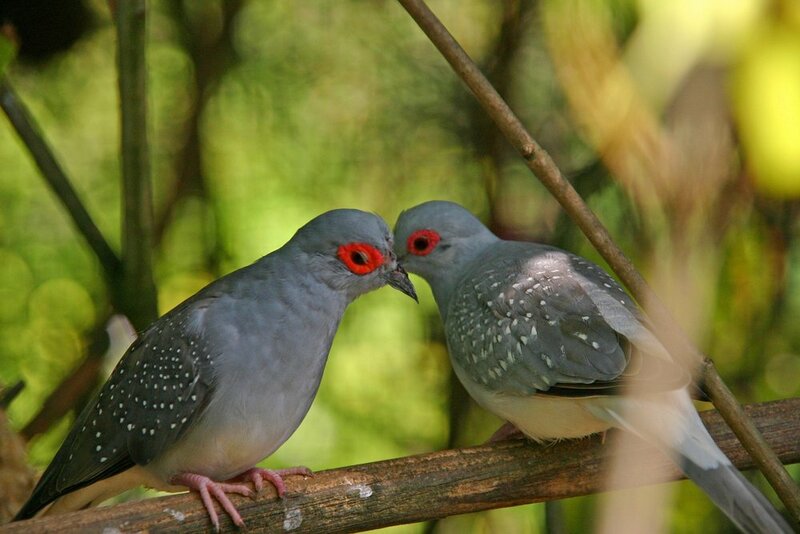 "Birds, kiss, love, red, grey, close-up" by Gil Dekel is Public Domain. Here we are heading into the shortest month of the year, already a month through winter, and it feels like life is speeding up. If you’re like us, you have a lot of projects on the go and it might be hard to find the time to update your training or read about new L&D ideas. That’s why these free one-hour webinars are so handy. If you can spare an hour, they’re often well worth the time. Note: The State of the Industry is available at www.td.org/SOIR2017. However, you do not need to have read the report to follow and benefit from the webcast. PowerPoint renders even the most interesting medical findings boring with text-heavy slides. This session will help you to revolutionize the way you use PowerPoint to make your presentations and training materials more effective. You’ll learn how to bring your data and discoveries to life, tell stories that have impact with clinicians and patients, and educate on even the most technical systems and processes in an engaging way using visuals, diagrams, and animations. In this webcast, you’ll learn to create compelling presentation material that facilitates discussion and aids understanding. You’ll discover productivity tips on creating content, quick formatting, and mastering data and charts. And you’ll learn to enhance your content so that it’s both effective and compliant. Plus, get a free PowerPoint toolkit to kick-start your efforts. Attend this webcast, and become a PowerPoint legend. Create slides and visuals that explain complex technical concepts. Develop your own custom content without leaning on your design resources. Convey clinical information that means something to physicians and medical staff. Understand how storytelling can be enhanced by, and not limited by, PowerPoint. Make sophisticated and navigable resources for interactive conversations. Change is the only constant in today’s world. Helping others navigate successfully through these turbulent times is arguably one of our most important professional competencies. In this webcast, join Marjorie Derven to explore how emotional intelligence (EQ) helps us lead others so they can best manage the inevitable stressors and uncertainty of change. Leveraging EQ is essential to manage our own biases and enhance the use of self as an instrument of change. Explore the four dimensions of emotional intelligence (EQ) and how they apply to change management. Identify your personal triggers and how they affect your role as a learning and change management professional. Discover how EQ can help you become a more effective change leader. You’ve launched a stellar manager development program. You and your learners feel ready to take on the world. Then . . . nothing happens. Where are the performance results you promised the business? Was this an epic fail? Good news: The session itself wasn’t a failure. Bad news: Without a street-smart plan for support and accountability, behaviour change and results are left to chance. Join us to discover the best, most disruptive moves you can make to ensure sustained results. How to get real about sustainment. What gets in the way back on the job. How to do sustainment right. eLearning developers for years have limited themselves by selecting a set of tools that has (mostly) resulted in boring learning experiences. The comparison point that users make is not other learning experiences but other media. In order to compare favourably to other media, developers must learn the tools used by other digital professionals. One of those tools is coding. In this fast-paced but approachable session, Mark Lassoff of Punk Learning will teach you to write your first lines of code—but you're not going to simply sit back and watch. You're going to write the code as Mark does, creating your first lines of executable code and whetting your appetite for more. You'll earn the title programmer as you complete the exercises in this session. More importantly, Mark will demythologize programming so you can start learning on your own. More organizations are using coaches as a key strategy to help develop leadership capabilities and increase the performance and productivity of their employees. Individuals who are coached see the value in working with coaches to help them achieve challenging goals and gain greater satisfaction in work and life. A good coach who builds trust and rapport can help employees get unstuck, shift their thinking, see new possibilities, try different behaviours, and achieve breakthrough results. Why coaching is so valuable. Five factors that ensure powerful coaching. The tangible and intangible benefits of coaching. How to measure coaching success. Be sure to submit a question that you are hoping the presenter will answer during the webcast. Join this webcast to discuss this year’s conference and listen to some great speakers! This is a unique opportunity to discover where the industry is heading and learn from the best practices in talent development and training. This webcast will share the trends in the field of talent development, while two Europe-based speakers from last year’s conference in Atlanta and the European Summit in Amsterdam will show examples of what awaits you in the world's largest gathering of talent development and training professionals. ATD 2018 brings the talent development industry to life by gathering together the game changers—the individuals who are shaping the industry; the legends, who defined best practices; and the practitioners, you—the lifeblood of this profession! When you reach your fullest potential, you can effectively develop the talent around you, giving your organization the ultimate competitive advantage. Middle managers get pressure to manage up, down and across the organization, but how can you deliver the skills they need without adding to their troubles? Ann Herrmann-Nehdi demonstrates easy-to-apply tools and strategies for helping your middle managers manage their own thinking more effectively and adapt, even in high-pressure situations. You’ll learn how to help them build their critical thinking skills and agility, so they can better lead and meet the needs of the business. And you’ll find out how to create developmental roadmaps for immediate and long-term business impact. Learning objectives are often an undervalued part of the design process, but they shouldn’t be. Well-written learning objectives tell your learners what you want them to know and do—clearly and concisely—and then help managers, leaders, and organizations measure their progress toward that knowledge and skill. Be sure to join Nikki O’Keeffe, facilitator of ATD’s Essentials of Writing Impactful Learning Objectives, for an interactive discussion about practical techniques and best practices for writing objectives that are behaviour-focused and measurable. The benefits of measurable and observable learning objectives. A method to assist in structuring your objectives and simplifying the objective-writing process. Best practices for writing learning objectives. When you join, bring along some of your organization’s current learning objectives, or a training project you are working on, as a frame of reference. Join this webcast to discuss this year’s conference, and listen to some great speakers! This is a unique opportunity to discover where the industry is heading and learn about the best practices in talent development and training. This webcast will share the trends in the field of talent development, while two British speakers will discuss examples of what awaits you in the world's largest conference of talent development and training professionals, the ATD 2018 International Conference & EXPO. ATD 2018 brings the talent development industry to life by gathering together the game changers—the individuals who are shaping the industry, the legends—those who defined best practices, and the practitioners—you, the lifeblood of this profession! When when you reach your fullest potential, you can effectively develop the talent around you, giving your organization the ultimate competitive advantage. With approximately 250 new hires per week, it’s critical for LHC Group, a leading home health care organization, to provide clear pathways to onboarding for both hiring managers and new hires. In this webinar, Regina Owens, LHC Group’s Manager of Instructional Design and Technology, will share how they developed a strategic learning roadmap for both employees and managers to facilitate a smoother, improved, and successful onboarding program through their LMS. Regina will share how the revised onboarding program has reduced errors and frustration for managers and new hires, while also decreasing the level of support required by other departments within the organization. Guiding employees through the orientation process and providing easy access to helpful tools and resources. Using a modularized approach to learning to increase employee engagement. Engaging top leadership to be invested in orientation completion. Leveraging microlearning to deliver immediate results and drive compliance. Join this webcast to discuss this year’s conference and hear from some great speakers! This is a unique opportunity to discover where the industry is heading and learn from the best practices in talent development and training. This webcast will share trends in the field of talent development while Hamza Taqi, a talent development professional based in Kuwait and a speaker in last year’s conference, will show you examples of what awaits you in the largest gathering of talent development and training professionals. ATD 2018 brings the talent development industry to life by gathering together the game changers—the individuals who are shaping the industry, the legends who defined best practices, and you—the lifeblood of this profession! When you reach your fullest potential, you can effectively develop the talent around you, giving your organization the ultimate competitive advantage. Valentine’s Day is just around the corner, and love is in the air! Well, at least it is for the learners at Polycom when it comes to their learning technology. So how did Polycom find lasting LMS love, when nearly half of companies today report their existing LMS no longer meet their needs? In this webinar presented by Melissa Wade, Technical Program Manager at Polycom, and David Wentworth of Brandon Hall Group, you’ll discover practical and research-based strategies for finding the best LMS for your organization. Based on Polycom’s experience successfully navigating the LMS evaluation and selection process, learn how to find an LMS you’ll really love! Best practices for selecting an LMS that will facilitate a culture of continuous learning. A proven technology migration framework for each phase of the LMS replacement process, from evaluation to implementation. How—and why—Polycom successfully switched to a new, centralized LMS for employees, partners and customers. When looking for a new learning management system, there are a multitude of questions that must be asked, starting with: What do I need my LMS to be able to do to allow us to reach our e-learning goals? However, one consideration that people often overlook is the type of technology that an LMS uses, which is important when evaluating whether an LMS will be able to provide the type of functionality you’ll need to meet your goals. Why the technology your LMS uses is important, including significant considerations regarding data ownership, security, LMS customization, product updates, and support. Are you considering pursuing the Certified Professional in Learning and Performance (CPLP) credential, but aren't sure if you're ready? Are you registered for the Knowledge Exam or Skills Application Exam, but looking for some advice on what study techniques have worked in the past? Or, do you have more general questions around the potential impact the CPLP can have on your career and goals? If these or any other burning talent development credential questions are on your mind, join us for an hour-long interactive webcast featuring three current CPLPs. Each panel member will share why they chose the CPLP, how they knew (or didn’t know) they were ready, their tried-and-true test preparations, and the impact the certification has had on their professional life. Throughout the 60 minutes, panelists will take any and all questions you may have. If the CPLP is right for you. Pitfalls to avoid during the credentialling process. Be sure to submit a specific question or two for the panelists when you register to attend. Help employees create an attachment, or “stick,” to your organization by identifying learning and growth opportunities that are meaningful to them. Cultivating an ongoing investment in the individual shows the employee their manager sees value in enhancing their knowledge. While most people may not start a discussion about learning with their manager, what they have to say when they are asked can make your organization stronger. Understand how discovering the learning goals of an employee can help the person “stick” to the organization. Discover how creating organizational attachment can drive business results. Identify how and when to create an environment for a successful stay interview. As we turn the calendar into a new year, training leaders are looking for the next big things in learning and development to help them modernize their training toolkits. And while augmented and virtual reality, predictive analytics, and machine learning are exciting, buzz-worthy technologies, they’re not what most organizations will focus on in 2018. Six of the top training trends for 2018 you can get on board with NOW. Actionable tips to help you get started with each trend. Three past training trends most organizations still struggle with. Developing effective learning for employees poses a challenge that is difficult for many employers to overcome: how to create learning that improves performance while enabling learners to also address their own goals and aspirations. In other words, how do organizations create learning that is beneficial for both the enterprise and the employees? The secret is designing learning that resonates with learners on multiple levels. A model for designing blended learning that is directly linked to business performance goals. Strategies for incorporating formal, informal and experiential learning in ways that meet the goals of both the organization and learners. Examples of how to design learning through which employees benefit from each other’s expertise and experiences through self-directed learning and social components. An understanding of the difference between learning choices that mimic Netflix and learning that engages employees so they are motivated to learn what the organization needs them to know. Most training and learning programs teach perfect answers, procedures, methods, policies, information, etc. This is well and good. But do we teach people how to make the right actions, better decisions, more reliable choices, and handle catastrophic errors? Most of the time, we don’t. The severe impacts are shown in slow or no actions, failures in judgment, errors in decision making, impulsive actions and risky actions. All of these impact organizations financially. What is Deep Dive Thinking and how do modern learners learn? Join the webinar and download the FREE “Deep Dive Thinking Implementation Process,” a guide on how to incorporate Deep Thinking in webinars, eLearning, classroom learning and coaching situations. It’s widely recognized that the model known as 70-20-10 defines how we learn, with 70 per cent representing informal learning we get on the job. Because most of us are accustomed to building formal learning (classroom events, e-learning modules, webinars—the 10 per cent), the idea of pivoting to informal learning may seem daunting. How to ensure you are creating competency-based learning skill practices. Step-by-step guidance on how to create a skill practice in a day. You want your LMS and learning to be intuitive, so that you and your users can be productive. In the analogy of a Bed and Breakfast, picture yourself as the host, and the users as your guests. Help them by illustrating what is available to them in the system, what to do while they are there, and anything they might need on their way out. Fortunately, a new wave of tools and strategies is illuminating the black box. This webcast will dig into the data that underscore just how important search is to your training videos, and look at 2018’s new best practices for helping your people find more of the instructional content they need, right when they need it. Why search matters when it comes to video-based training materials. The technical reasons why tools like a learning management system and a content management system can’t effectively search video content. Join Dr. Pooja Jaisingh, Senior Adobe Learning Evangelist, to learn about some nifty tips and tricks to create eLearning courses like a pro using Adobe Captivate 2017. Along with the tips, you’ll learn about some shortcuts and workarounds to make the eLearning creation workflow simple for you, yet more effective for your learners. During this webinar, you’ll also get an opportunity to share some of your own secrets with your fellow eLearning professionals. Register now for this collaborative and fun session, and start building your courses like a pro! This webinar will cover what it is, why it matters, and how it helps you prove the value of what you create. Sales leaders often find themselves relying on a few "rock stars" to hit their numbers, along with a few sales reps whose heads are on the chopping block but somehow pull out the biggest deal on the last day of the quarter. Too often organizations hold on to mediocre reps and hope that the rock stars will carry the team. The result: massive uncertainty as the quarter winds down, and a few deals sitting with a handful of sales reps who will make or break the number. Sound familiar? How can sales leaders replace this uncertainty with a confident view of their teams' likely performance? How can proactive leaders know which reps need help before it affects revenue? The right metrics sales leaders should use to easily and accurately assess sales competency. The factors that contribute most to fast quota achievement with new hires. The actions to take when assessments indicate competency gaps. Candidate experience is a big focus for the majority of organizations. According to Brandon Hall Group’s 2017 HCM Outlook Survey, 63 per cent of organizations are paying moderate to heavy attention to candidate experience. And, a substantial part of candidate experience is how organizations communicate with their candidates. However, there is evidence to indicate that organizations are struggling to effectively communicate with candidates. Sure, hiring workflows can be complicated and your organization may be inundated with resumes. But how your organization communicates with every candidate is critical throughout the entire recruitment/hiring process and is key to improving candidate experience and hiring quality talent. Join Daria Friedman, Principal Analyst for Talent Acquisition at Brandon Hall Group and Birch Faber, Marketing Director for TextRecruit, as they discuss how organizations can improve candidate communications and candidate experience. Defining candidate experience, communications, and their impact. Improving communications throughout recruitment/hiring process. Technology that facilitates candidate communications.